RICHMOND Raceway is a 0.75 flat asphalt oval racetrack with 14 degrees of banking in all 4 of the turns, 8 degrees on the backstretch and just 2 degrees of banking down the front..Nobody has really won a whole bunch here lately but you can expect the same Penske and JGR teams to be strong once again this weekend for Cup.. Optional gave 5mike5 20 Betpoint(s) for this post. Last edited by Optional; 04-09-19 at 02:26 AM. Last edited by unlearn; 04-11-19 at 12:07 AM. Have to fade sadler. Always. "Unable to place wager. This type of wager is restricted from your account." Last edited by 5mike5; 04-12-19 at 06:18 AM. Also means having a good quali car may leave you with a bad race car for the start. Just bet your unit size (we will say 1 for shits and giggles) on Bell at +185. Bell wins, now you have 2.85 units off your original bet. 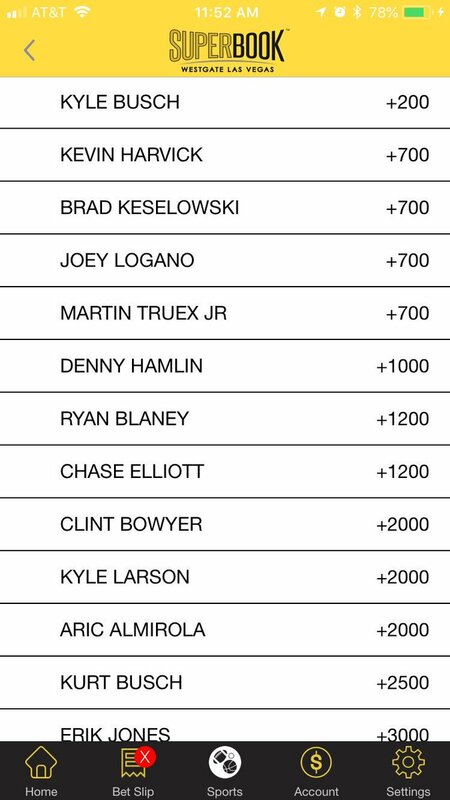 Put that 2.85 units on Kyle Busch after. So funny books blocking parlays on seperate races at different times. Also leaves you an out if for some reason Kyle Busch has some huge issues at practice or qualifying. Or do an open parlay? Didn't add anything else for Xfinity hope odds get shuffled up. Will open parlay Bell. Last edited by 5mike5; 04-12-19 at 05:54 PM.